Hello and welcome back to TAY Progress Report, where we all meet our goals, fall in love, and move away to Mexico. What is it? 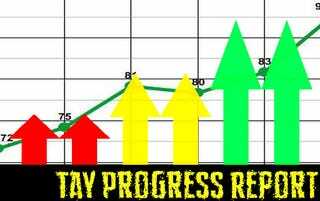 Progress Report is just a place to have a record of your progress. If you finish everything in your list you can pick a toy out of the toybox (toybox coming soon). How do I get involved? Just leave a note in the comments: What your projects are, and what your progress is and you’ll be added to the list. Why? Community building? Something to do? Hold each other accountable? Posterity? I don’t know. Seemed like something fun to try. Slog through Vampirella: Feary Tales and write a review. This one was a mistake. Not a fan. July 6th 2015 - 1. 25/85 2. Practice talk tomorrow, 3. 3 pages in out of 117ish. Stream or Record my first experiences with Legend of Eisenwald, a review copy I was given. July 6th 2015 - 1. Almost done, 2. Don’t want it to end 3. 3/5 done! July 6th 2015 1. renewed permit, 2. grinding 3. It’s awful. 4. PROFILE SEMI COMPLETE 5. Working on Hyperdevotion Noire 6. DONE! Publish something that requires substantial effort (?) once per week. Get all my paperwork ready for a new passport and convention stuff. July 13th 2015 - 1-7: Too many to list! Read her post!